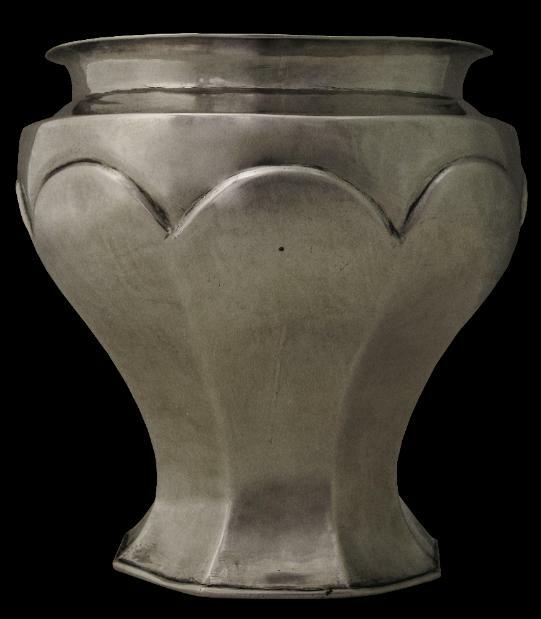 This unusual high-grade silver vase or spittoon has a wide octagonal foot, a tapered body that opens to a wide lipped mouth. The base comprises sheet silver that has been hand-cut and carefully hammered over the edge of the foot, creating a water-tight seal. The base is marked with an indistinct mark in Arabic. The streamlined geometric, faceted, curved form is typical of the period – art deco – reminiscent of architectural forms such as the spire of New York’s Chrysler Building, completed in 1928-30. Africa’s best examples of Art Deco architecture are to be found in Eritrea, particularly in its capital Asmara.